One day you have a disarmingly cute kitten, the next you’re living with a lanky teenage cat who has decided it’s time to make his mark on the world—literally. He’s scratching, marking, yowling, yearning to be free. All of a sudden, your adorable kitten is really hard to live with. Welcome to feline adolescence. From approximately 6 months to 18 months of age, kittens mature into cats, a process that is both fascinating and frustrating. Fascinating because it’s always interesting to see a youngster develop, and frustrating because, well, it’s like life with any teenager: your cat is full of energy that he doesn’t know what to do with, and he wants to make his place in the world—ideally at the top of the heap—by testing his boundaries with you and with any other cats in the household. That might mean scratching on the furniture to leave scent marks identifying the object as his, urine marking furniture or other objects for the same reason, and picking fights with other cats. At the very least he’ll be showing off his physical prowess by jumping to the highest points in the room and sometimes clumsily knocking over Great Aunt Jane’s Chinese vases in the process. Adolescence is also the time that your kitten reaches sexual maturity. It’s hard to imagine, but your little kitten can be ready to produce kittens of her own or contribute to the kitten-making process when only 5 months old. If your female kitten is suddenly screaming and rolling with desire, she has just gone into heat, or estrus. This ear-splitting torture, er, phase, usually lasts about a week, during which time you’ll need confine her as securely as if she were in Alcatraz so that no males are able to heed her siren call. Immediately afterward you can have her spayed, so that neither of you has to experience that again. To eliminate the chance of your cat going into heat and to reduce unwanted sexual behavior such as urine marking (which can be done by both males and females), have your kitten altered when he or she is 3 to 4 months old. That might seem early, but it’s an easy surgery at that age. 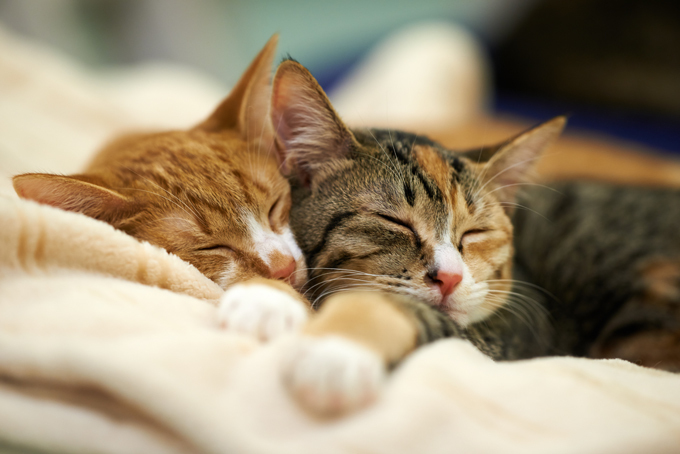 Kittens bounce back quickly, more so than older cats who undergo spay/neuter procedures. Your female will never experience the frustrations of an unrequited estrus, and your young male will be less likely to express the belligerent behaviors of swaggering tom cats set on conquering territory. So that you and your kitten both survive his adolescence, channel his energy through puzzle toys, trick training and daily play times. If he tries to use your body parts as playthings, warn him off with a squirt of water or canned air, or hiss at him and walk away, just like his siblings would do. Make sure he has plenty of interactive toys that will engage his brain and give him opportunities to hunt, stalk and chase. A tall cat tree will give him an outlet for climbing and scratching. Trick training teaches self-control and can help you redirect some of those behaviors you don’t like. Be patient and keep a tight hold of your sense of humor. This too shall end, and one day you’ll wake up to find yourself living with a serene, well-behaved adult cat.